﻿ Best Price on Cabanas Canas Castilla in La Cruz + Reviews! Cabañas Cañas Castilla is located on the shores of Sapoa River and 10 minutes’ drive from La Cruz town. It features Orosi Volcano views and one day tours to Nicaragua. The accommodations include a fan, safety deposit box, seating area and a dining area with a fridge. They also feature a furnished terrace with garden and river views. The bathrooms are private and have a shower and free toiletries. The restaurant at Cabañas Cañas Castilla serves local food and snacks for breakfast and dinner. The guests can also enjoy homemade bread and wine made from regional fruits. 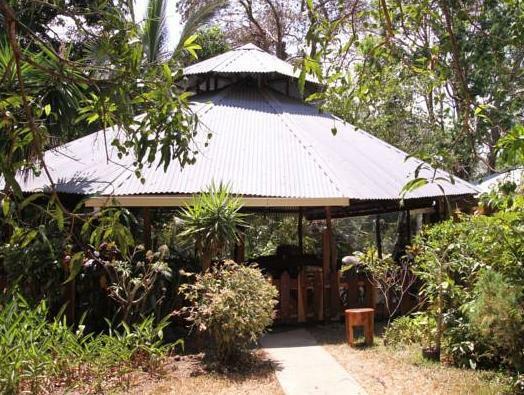 This property can arrange activities like hiking, horse riding and birdwatching. It can also provide information about Santa Rosa National Park and Rincon de la Vieja National Park. Salinas Bay and Puerto Soley Beach are a 30-minute drive from Cabañas Cañas Castilla. San José Town Center and Juan Santamaria International Airport are 5 hours’ drive away. Please note that the first night of the reservation must be paid in advance. Once a booking has been made, the hotel will contact the guest directly to arrange payment by PayPal.